Thank you for your interest in the U.S. Service Academies. As your 4th District Representative in the U.S. House of Representatives, each year I have the privilege of nominating a limited number of people to four of the five service academies. The honor of attending a service academy comes with an obligation and commitment to serve in the military for a minimum of five years upon graduation. For more information, please review my page of Frequently Asked Questions for those seeking a Service Academy Nomination. Best wishes to you as you pursue your goal of attending one of the U.S. Service Academies and serving our country. To request a Service Academy Nomination from my office, please download and complete the form below and submit it to the Gulfport District Office along with the required documents listed below. 1. Application Form- Complete, Sign, and attach a photograph. Application forms for 2019 will be available May 1st. 2. Letters of Recommendation- Ask your high school counselor or principal to provide a letter of recommendation as well as two other letters of recommendation from teachers, coaches, employers, or someone who knows you well. Have the individuals send the letter to you in a sealed envelope with their signature across the seal. 3. Academic Resume- Please attach a resume to include, academic accomplishments, GPA, activities, offices held, sports played, awards won, part-time or summer employment, church activities, etc. 4. Transcript- Ask your counselor or principal to provide you a copy of your school transcript. Make sure the transcript includes your course listings and grades through the end of your junior year, current Grade Point Average and class rank (if provided by your high school) and SAT/ACT scores (if provided by your high school). The official transcript should be returned to you in a sealed envelope with a signature across the seal. If your school will not provide transcripts directly to students, have the school mail the transcripts to the Gulfport District Office with a note reflecting this policy. 5. Standardized Test Results- To have ACT / SAT scores forwarded to our office directly from the testing center, please use the following ACT Code: 7496. Many transcripts include standardized test scores and if so, that will be sufficient. If you are interested in applying to the United States Military Academy, you must take the SAT. 6. Essay- On a separate sheet of paper, in approximately 500 words, state why you want to attend a U.S. Service Academy. 7. Deadline- Completed application packets must be received by October 15, 2019. No Exceptions. Click here for the 2019 Service Academy Application. Important Note to Applicant: To be considered for a nomination, applicant must initiate a pre-candidate file at each Academy to which they are seeking a nomination. 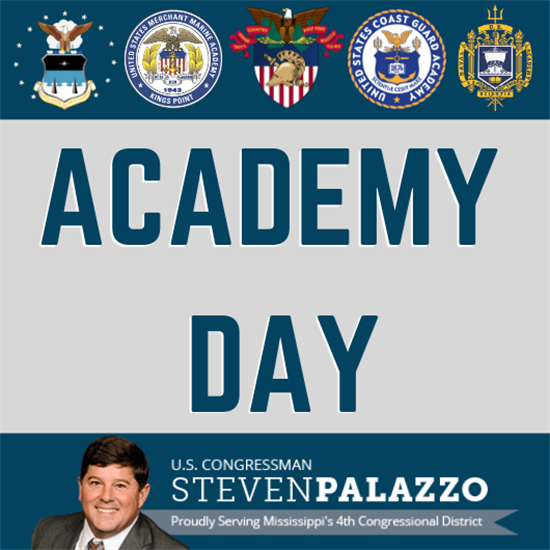 Don't forget to attend Academy Day this year at Mississippi Gulf Coast Community College!